You’ve surely heard this valuable piece of advice. Don’t mess around fixing something that isn’t broken, as you will probably mess things up even more than before. But what about those things that aren’t broken yet still appear to be destructive? Don’t fix it. Channel it correctly. Let’s take fire for example. Is fire good or bad? If images of a blazing, out-of-control fire come to mind, then certainly fire is bad. But without fire, how would you cook your food and stay warm in the winter? How would you design jewelry and mold metal? Fire isn’t so bad then, is it? It all depends on how it’s being channeled. A fire that’s out of control is dangerous and devastating. A fire that’s channeled correctly and its full strength applied in a controlled manner, can accomplish amazing things. Water, too, can be a destructive tsunami or a thirst-quenching, life-giving precious commodity. It all depends on how it is channeled and controlled. If you or your child has been diagnosed or even just randomly labeled as having ADD or ADHD, you can certainly identify with the chaos of an uncontrolled blaze or tsunami. But did you know that by properly channeling your strengths, you can accomplish amazing things? ADHD coaching is an effective way of maximizing on the strengths of the ADHD personality, while learning to cope with the deficiencies. A person with ADHD should not resign himself to living as if handicapped. Coaching helps improve executive functioning by focusing on organizational skills, time management, scheduling and planning, reducing procrastination and other essential skills that may come naturally to some people, but can be utterly confounding to the person with ADHD. Coaching and Therapy: How are they Different? There is a fundamental difference between coaching and therapy. Therapy focuses on “fixing” the crippling effects of unhealthy thought patterns, traumatic memories, abuse, or detrimental behavioral conditions. In any such scenario, therapy is usually a vital part of the healing process. During therapy sessions, the client unburdens himself and expresses the pain, while the therapist aims to restructure past and present experiences in an emotionally healthy light. In contrast, the ADHD Coach sees the client as a capable, healthy individual that struggles with executive functioning, organization, prioritization, planning, and related skills. The coach aims to empower the client to capitalize on the strengths of his personality while overcoming the drawbacks. It is an invigorating, positive experience, totally practical and goal-oriented. Some children with ADHD who have been mislabeled as losers, “bad”, or have suffered repeatedly from frustration and humiliation may require therapy to rebuild their self-esteem and regain trust in adults and the world in general. Of course, it is best to avoid reaching this point. ADHD Coaching is an effective method of building your child to prevent having to “fix” him later. Does Coaching Take the Place of Other Interventions? 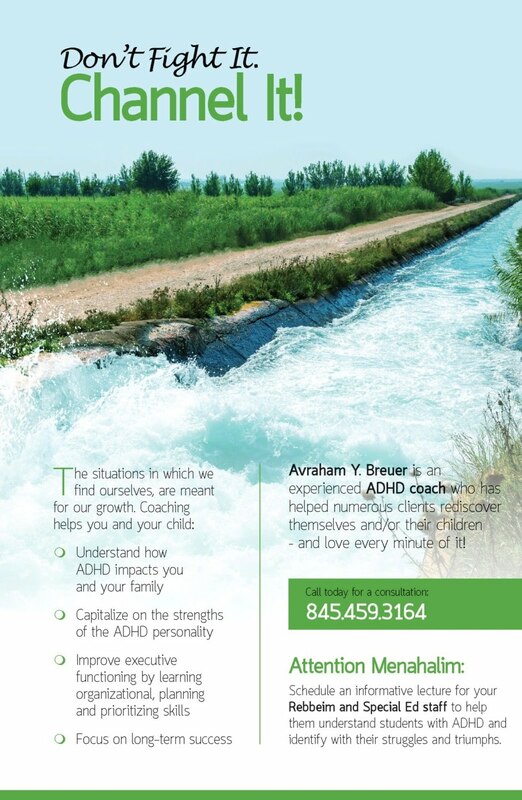 A common question that clients have is if ADHD Coaching will replace medication or other therapies. Since every case is unique, it is impossible to generalize or make any claims across-the-board. Getting back to the analogy of a fire, when channeling it towards a constructive purpose, one must still be careful to keep away from flammable material nearby that can ignite an out-of-control blaze. Likewise, there are many factors in our environment that may be triggers for people with ADHD. Some children respond very well to brain-training exercises, supplements, prism lenses or other interventions. In many cases, parents make the decision to give their child medication after considering all of the pros and cons. An ADHD Coach respects the parents’ decision regarding these matters and works along with them for the child’s benefit. There is no pressure to stick to a specific game plan, as long as the approach is open-minded and beneficial for the child’s long-term success. If you were given this challenge, you have what it takes to make the best of it. Become a knowledgeable, supportive parent with an impressive toolbox. Empower your child to grow and blossom with the strengths he has. Don’t waste another day trying to fix him. Instead, utilize professional ADHD coaching to discover the positive traits in your child and maximize on it for everyone’s benefit!